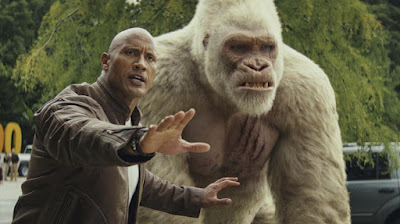 It looked for a while as though new entry Rampage, even given the draw of The Rock, might not be able to displace reigning movie A Quiet Place from the top of the box office. But, surprisingly for a film that features giant monsters smashing things, it squeaked past, earning $34.5 million, according to studio estimates. Worldwide, the new movie has taken in more than $148 million, and should be on course to be another success for Dwayne Johnson and director Brad Peyton. Still, A Quiet Place managed to score $32.6 million, so the horror thriller isn't exactly suffering. That film has taken nearly $100 million in just two weeks, and is past $151 million globally. That's despite new horror competition from Blumhouse's Truth Or Dare, which looked to target more of a teen audience. The film scared up $19 million for a third place launch, a fine opening given the movie's lower budget, but not quite the same level of success as, say, Get Out. Ready Player One was pushed to fourth on $11.2 million, while comedy Blockers rounds out the top fifth for $10.2 million. In sixth place, Black Panther saw little impact from its home entertainment release announcement, as it still took in $5.3 million for a 673..7 million domestic total. Isle Of Dogs boosted its screen count and jumped from 10th to seventh with $5 million, even as I Can Only Imagine slipped a couple of places to eighth with $3.8 million. At ninth, we find Tyler Perry's Acrimony, earning $3.7 million, while Chappaquiddick fell to 10th on $3 million.